This was great fun to make. The dancer’s mom (from the US) sent me a sketch and asked me to realise it for her. I’ve worked with her before and she has great design ideas and understands the constraints of dance. I must admit, lots of people don’t and it’s sad to disappoint people when their ideas are not feasible … but this one worked beautifully. Tiger print of course was a must but then I was faced with how to decorate. 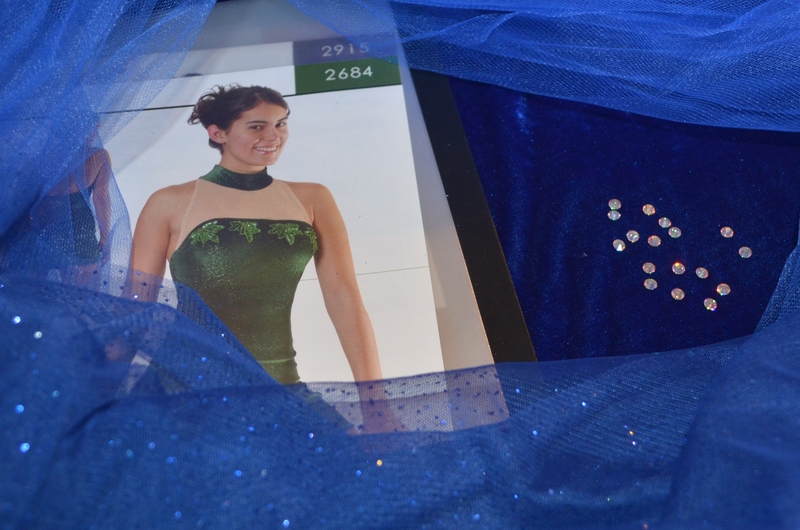 The answer came when I delved into my trove of rhinestones … tiger teeth and bright metallic gold trim. The high collar decorated with jewels was just what my client was looking for. This was no wild tiger. I had just enough of these rhinestones for the hip decoration too. I bought then a few years ago thinking they’d come in handy for something. I knew I’d find the perfect application at some point. A full circle mesh skirt with 4 slits (offset from centres and sides) provided plenty of coverage but opportunity for the dancer’s leg-line to be seen. Little arm cuffs completed the picture. This is a little costume for a 10 year old. They wanted a crop top and shorts with a big bow at the back. We hunted through patterns and found this Jalie Ice skating dress and decided to make the crop top from this. I’m not a real fan of strappy costumes but this one is quite lovely. 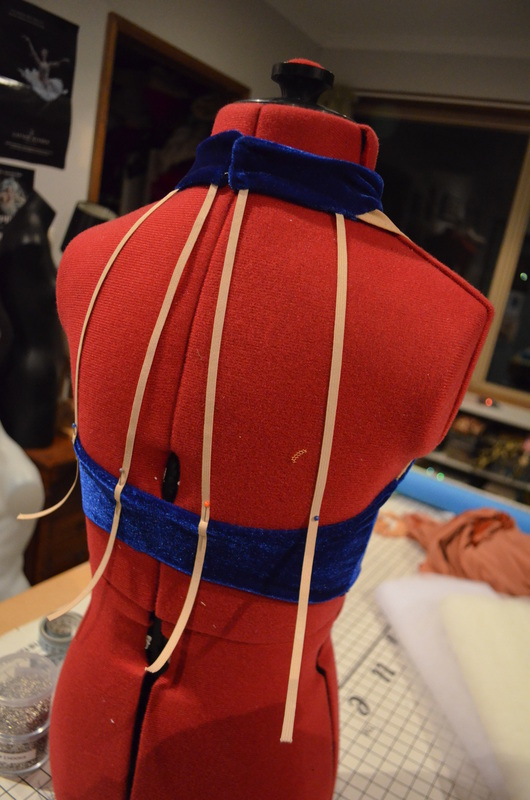 It has 4 narrow straps radiating from the neckband to the back of the costume. It’s almost a halter neck. I glammed up the elastic with some Czech rhinestones . For the front I sewed on a few acrylic rhinestones that have a nice bling effect. 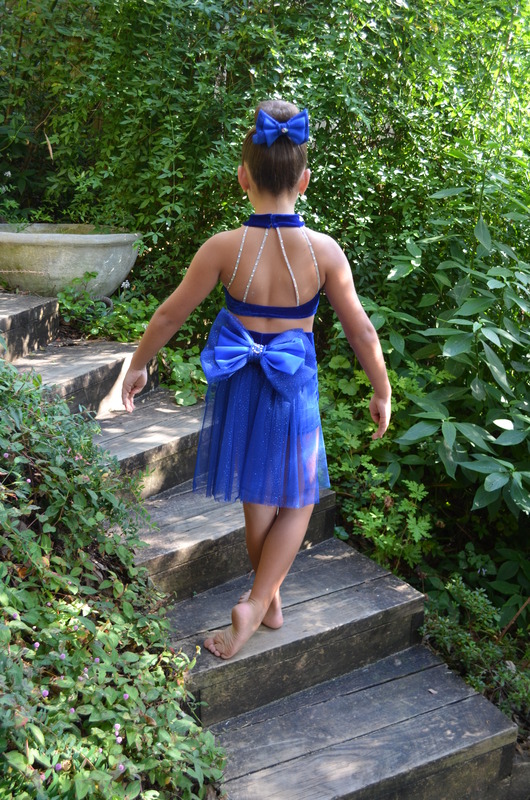 The finishing touch was the bow bustle and the back skirt in blue sparkle tulle. 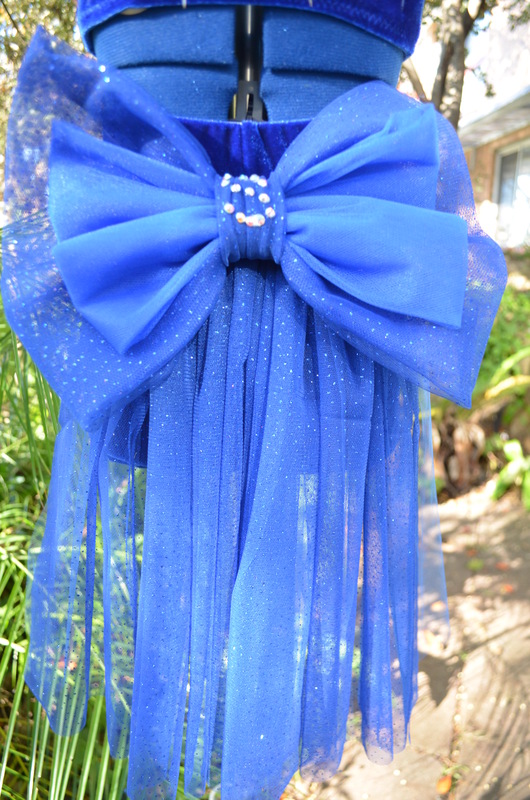 The bling in the middle of the bow is the dancer’s initial! After the fitting we decided that a unelasticised wide waist band would be better s so I sent Mum and daughter off for cake and coffee while I changed the waistband (and made a wee bow as a hair piece and I needed to tweak one of the straps). doesn’t the colour suit her! 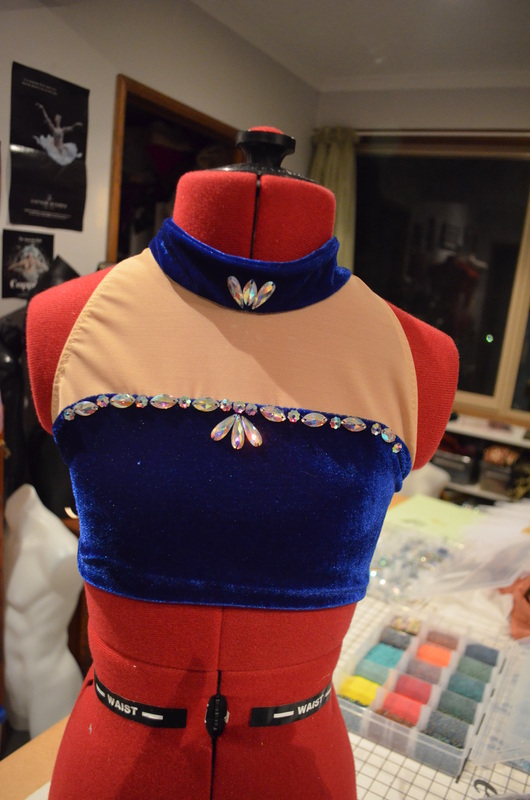 The back of the costume is so cute … “someone” kept wiggling her bum and looking over her shoulder at it! It was lovely to meet this lovely bright young dancer and her fabulous Mum! They even bought me a little present for squeezing them into my busy schedule!